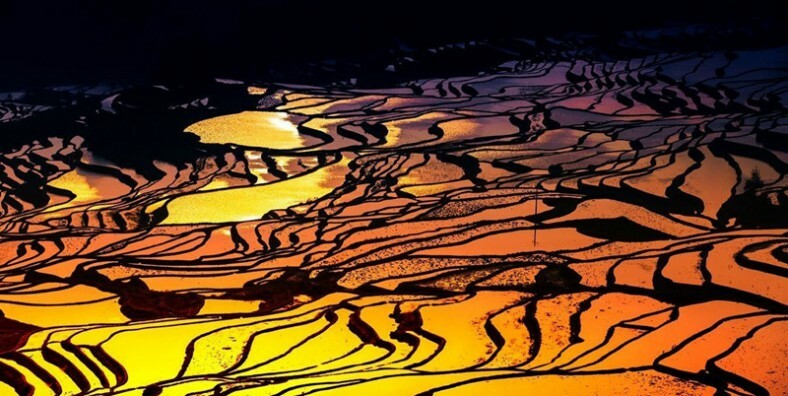 Due to the geographical location, Yunnan is the best gateway to travel Vietnam. Kunming, Jianshui, Yuanyang are always waiting you to discover their beauty. Besides, this tour will take you to explore the ethnic culture in Sapa and visit the highlights of Hanoi. 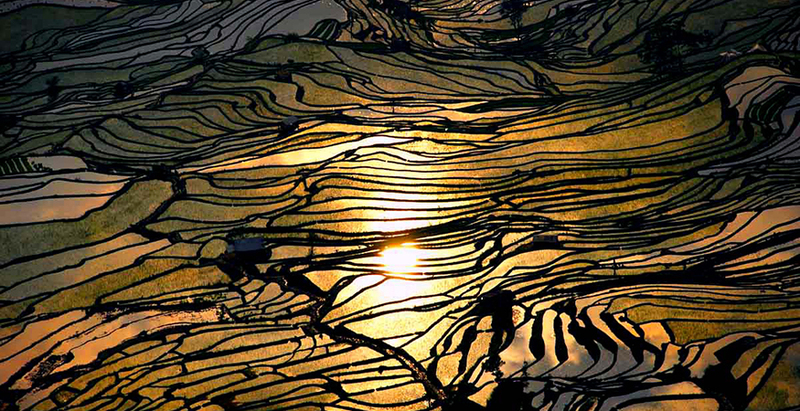 Experience the history and culture of Jianshui county, Yunnan. 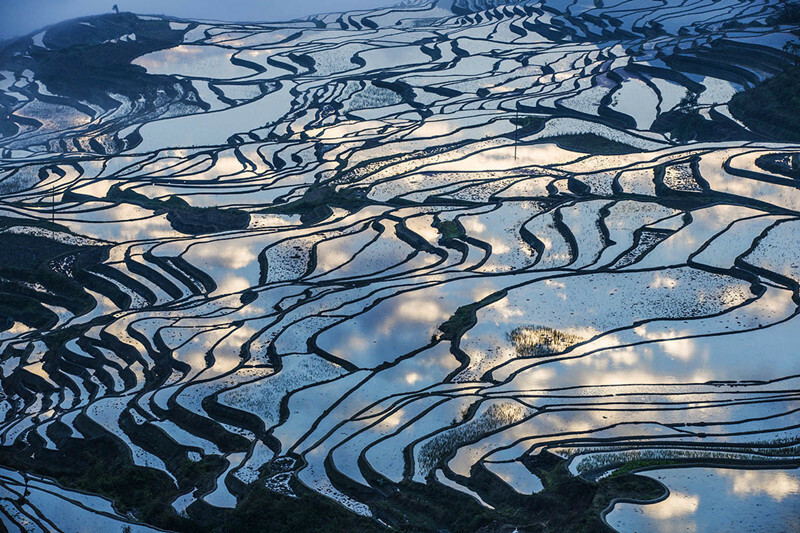 Enjoy the spectacular views of Yuanyang Rice Terraces. Learn more about the ethnic culture of Hani, Black Mong, Giay and Red Dao. Upon your arrival, picked up by tour guide and transferred to your hotel for a short rest. If time allows, we will head to Flowers and Birds Market to enjoy the colorful and fragrant flowers. After that, stroll along the Green Lake, established in the 17th century on the west side of the Wuhua Mountain, which is sometimes described as a “Jade in Kunming”. During the winter months, black-headed gulls from Siberia migrate to Green Lake and entertain the crowds of visitors. At 08:30am, meet your tour guide & driver at the hotel. Then head to Jianshui and stop to visit Xingmeng Mongolian Village on the way, the.biggest Mongolian village in Yunnan. 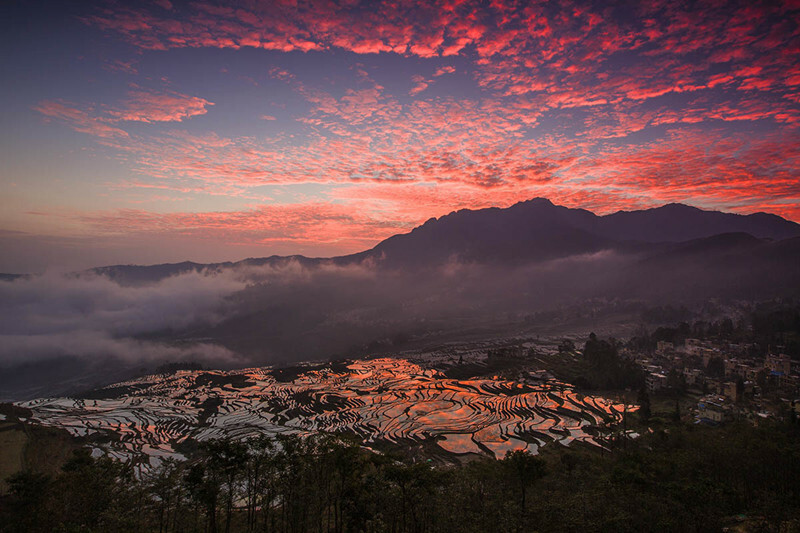 Get up every early in the morning, you’ll drive 30KM to visit Duoyishu Village and enjoy the sunrise of Duoyishu Rice Terrace Fields when the sun appears above the eastern horizon. 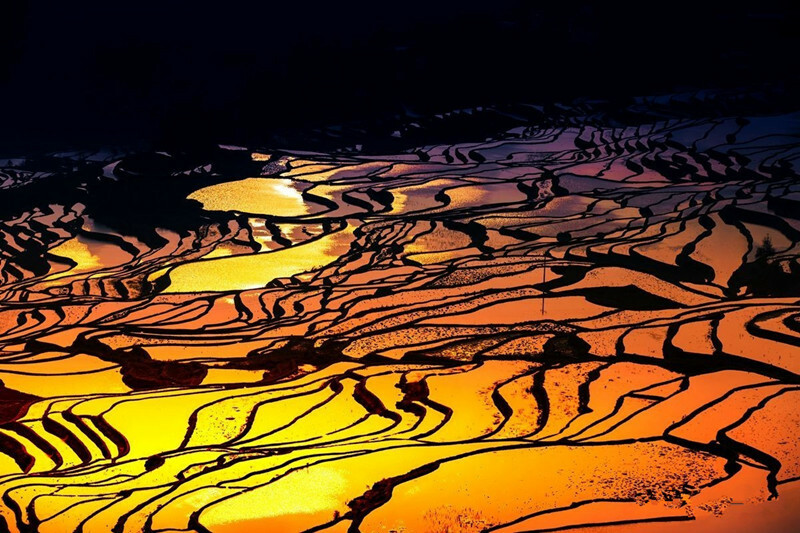 The terraced fields are ring upon ring and cascade one by one. They go along the hillside up to the sky. You will see the scenery of the terraced fields from the top of the mountains to the bottom. They are all farms under the sunshine and cloud and mist. The landscape is spectacular. After that, head to experience the local Market – Shengcun Market where there are filled with local merchandise and customers for selling, exchanging or buying various kinds of fresh products, animals and trifles. Later drive across China-Vietnam Border to Lao Cai Province and continue the trip to Sa Pa Town. At around 08:30 am, we will head to Y Linh Ho village, the home to the Black Mong people. Enjoy the scenery of beautiful valleys lying between mountains. After lunch, hike into the Muong Hoa Valley and visit Lao Chai village where the black H’mong people are living. Enjoy the fresh air, see terrace fields and stream along the way. Interact with the hospitable local people, learn about their culture and customs. Then walk to Ta Van village where many Vietnam ethnic minority groups gathering and living. Residents here are mainly the H’Mong ethnic, Giay, and Red Dao. Also we will visit a local Catholic Church. After the tour, drive back to Sapa. At around 08:30 am, we will head to visit Ta Phin village, the nearest village of Red Dao’s ethnic group within the area of Sapa area. The ethnic people offers eye-catching distinctively hand-made brocades with numerous bright colors and patterns. After lunch, continue the tour to Silver Waterfall. Being one of the most beautiful waterfalls in Vietnam, the water flows down as silver so that people here called it Silver Waterfall. Move on to Heaven Gate and discover spectacular natural paintings with dense forest, also see the difference between Lao Cai and Lai Chau provinces. After the tour, get back to the hotel for a rest and then be transferred to the station for the night train to Hanoi. We will arrive at Hanoi in the early morning. Upon arrival, transferred to the transit hotel near the station for taking a rest and then have breakfast. Then start today’s Hanoi city tour. The first stop is Ho Chi Minh mausoleum, the final resting place of Vietnamese Revolutionary leader Ho Chi Minh, known to his people as Uncle Ho. Then visit the surrounding sites of One Pillar Pagoda and his ancient house. Continue the trip to the Temple of Literature. Built in 1070, the temple hosts Vietnam’s first national university – the Imperial Academy and is dedicated to Confucius, sages and scholars. After lunch, head to visit The Vietnam Museum of Ethnology, which focuses on the 54 officially recognised ethnic groups in Vietnam. Later transferred back to the old quarter and visit Hoan Kiem Lake. Ngoc Son Temple, a pagoda sitting in the centre on a small island, is in commemoration of the 13th century military leader – Tran Hung Dao. Then experience the local life around the old quarter on a Cyclo. After breakfast, explore this city at leisure until being transferred to the airport for your next destination. Service ends.